I need to replace my shoes. The pair I have been wearing have been great up to this point but they are beginning to fail. They have travelled the first two hundred sixty six miles of the PCT twice. They have travelled the sixty-four miles of the PCT between Echo Summit and Donner Summit twice. They have given me over six hundred miles of reliable and solid trail service. So its with some sadness that I will be leaving them behind. 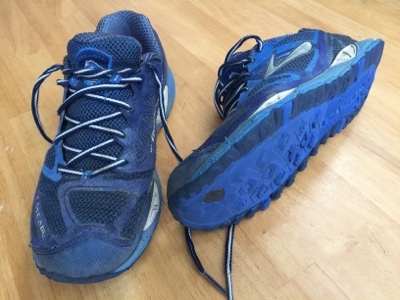 Good bye my faithful friends, my Brooks Cascadia 9s. I have added a brand-new pair of Brooks Cascadia 11s to my set of tools. I am expecting the same reliable and faithful service from them that I got from my 9s. I notice the upper seems to be made of a different fabric than the 9s. While descending Mt San Jacinto I compared my 9s to Ash's 10s. We noticed that the material in the uppers of the 10s was essentially the same as the 9s. 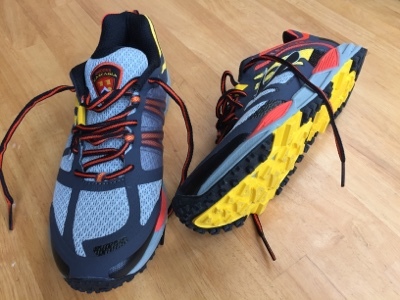 The reason that I am even boring you with this is that there has been a lot of chatter in the thru-hiker online community about the failure rates of the Cascadia 10's uppers at the hinge point on the inside above the ball of the foot. I see this same failure in my 9s. Even though it took six hundred miles to occur rather than the two hundred miles that some thru-hikers were reporting. This is only the first of at least four shoe replacements I anticipate I will need to make to complete the entire two thousand six hundred and sixty three miles of the PCT.